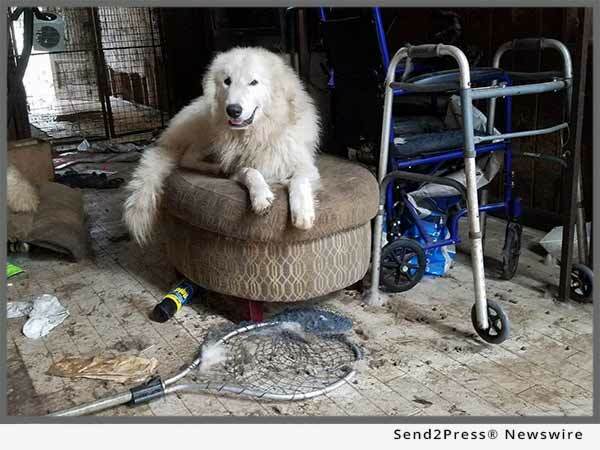 The woman, a breeder of Great Pyrenees, once bred award winning dogs but over the past 10 years her physical health had deteriorated to the point that she was confined to a wheelchair. The dogs began a downward spiral of their physical condition, and the elaborate yards built to hold them no longer did. Uncontrolled breeding and lack of care for the dogs had been going on for years and the scene was deplorable. Thirteen of the dogs and 10 of the cats – the critical, old, and young – were brought to Alaqua for urgent care. On Monday, the remaining 55 dogs and nine cats were rescued and it was no small feat. Alaqua Animal Refuge was joined by 12 rescue groups and organizations from across the United States to aid in this monumental and impressive rescue effort. After a week of extensive planning and coordination, it took a total of 45 people, all day, to get these massive dogs out of the house and off the property to safety. After the dogs are thoroughly rehabilitated, they will be available for adoption through one of the rescue groups that assisted in this huge endeavor. Many of the rescue groups specialize in larger breeds, especially Great Pyrenees, and they always have many gentle giants in need of loving homes. Rescue organizations that assisted in the relief effort included The Humane Society of the United States; The Lucky Puppy Rescue; Florida State Animal Response Coalition; Big Bend Disaster Animal Response Team; Great Pyrenees Club of America; Tri-County Animal Rescue; Big Fluffy Dog Rescue; Tallahassee Big Dog Rescue; Leon County Humane Society; Great Pyrenees Club of Western Pennsylvania Rescue; Pittsburgh Aviation Animal Rescue Team; and Florida Great Pyrenees Rescue & Club. 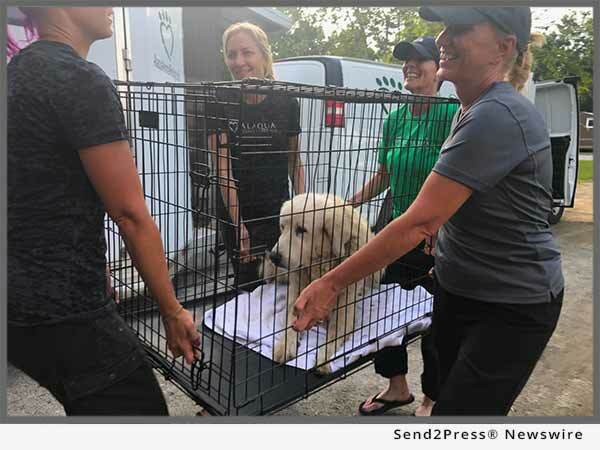 “The team of volunteers, rescue groups, and staff that Laurie put together did a phenomenal job of humanely removing the dogs from the property and evaluating them for transport to the facilities where they will be rehabilitated. Overall, the rescue couldn’t have been done any better,” said Bevan. The presence and support of local law enforcement is always an invaluable one, especially in cases such as this. With animal hoarding and abandonment cases, among others, local officials’ involvement is key. Animals’ lives, both present and future, depend on it, as does future laws protecting animals against neglect, cruelty, or hoarding. This was certainly a team effort, based on a passion and love for these majestic animals. From the first dog that was taken out of the house and walked on a leash to his transport to the last one that had to be carried out because he could barely walk—their eyes told their life stories. It filled many of the volunteers that were onsite with tears, with smiles, and with love and appreciation for the human spirit wanting to help. Although an incredibly heartbreaking situation, including the loss of life of the dogs’ owner, this massive rescue ended on a positive note, as they are getting their second chance — at life and to find a loving permanent home, again. The rescue of these 87 animals has incurred an enormous amount of expenses, especially in medical evaluations and treatments. The daily work at Alaqua Animal Refuge, including large rescues such as this, could not be done without the support of our community and beyond. Alaqua Animal Refuge is a no-kill animal shelter and sanctuary, located in the panhandle of Florida. A member of the Global Federation of Animal Sanctuaries, Alaqua believes that every abused, neglected and homeless animal deserves a second chance. Committed to providing protection, shelter and care to animals in need, this private, 501(c)(3) non-profit Refuge also offers a full-service adoption center, educational outreach, and community programs that extend far beyond their geographic location. Since its inception in 2007, Alaqua has become a recognized leader in animal rescue, welfare, cruelty prevention, and advocacy. Alaqua is currently in the midst of a relocation and expansion capital campaign to build a one-of-a-kind facility — the first in the United States — on 100 donated acres. The new facility and sanctuary will allow Alaqua to continue all of the important work that is done now, as well as be an educational and training center to empower others to help animals and recreate the model worldwide. 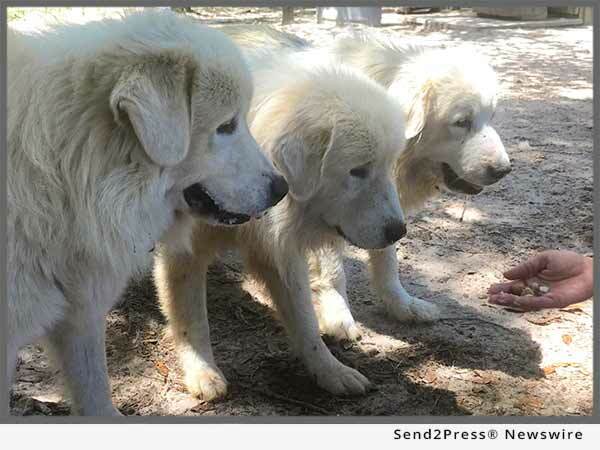 Photo Caption 1: Three Great Pyrenees eat kibbles from the hands of a volunteer in an effort to earn their trust. Photo Caption 2: One of the many dogs that lived in the house with floors covered in urine, feces and hair. Photo Caption 3: Alaqua staff transporting one of the majestic dogs to his new temporary home while he can be further evaluated medically, before being adopted. Alaqua Founder Laurie Hood said, "I am personally grateful to the Lucky Puppy Rescue who played a key role and was instrumental in providing essential daily food, water, and care for these dogs until they all could be rescued." Alaqua Animal Refuge is a no-kill animal shelter and sanctuary, located in the panhandle of Florida. A member of the Global Federation of Animal Sanctuaries, Alaqua believes that every abused, neglected and homeless animal deserves a second chance. Committed to providing protection, shelter and care to animals in need, this private, 501(c)(3) non-profit Refuge also offers a full-service adoption center, educational outreach, and community programs that extend far beyond their geographic location. Since its inception in 2007, Alaqua has become a recognized leader in animal rescue, welfare, cruelty prevention, and advocacy.